You'll be £12.99 closer to your next £10.00 credit when you purchase Tracing Your Black Country Ancestors. What's this? The Black Country in the West Midlands is an important site for family historians. Many researchers, seeking to trace their ancestry back through the generations, will find their trail leads through it. And yet, despite the burgeoning interest in genealogy and the importance of the region in so many life stories, no previous book has provided a guide to the Black Country's history and to the documents and records that family historians can use in their research. In this accessible and informative introduction to the subject, Michael Pearson looks at the history and heritage of the region and gives a graphic insight into the world in which our ancestors lived. He concentrates on the role the Black Country played during the industrial revolution when the development of mining, industry and transport transformed the economic and social life of the area. This was a period when living and working conditions were poor, families were large, children worked from an early age, often in the mines, and life expectancy was less than 20. And it was the era in which the Black Country took on the distinctive identity by which it is known today. A fairly recent addition to the extensive Pen & Sword family history series, this guide comprises 160 pages about local history, 30 pages about local records and a useful index. Four well-illustrated chapters are devoted to local industries: mining, iron and steel, transport and the astonishing diversity of manufacturing which characterises the Black Country. Another four provide well-summarised histories of local life, recreation, religion and crime and punishment. The author clearly is proud of the Black Country and well qualified for his task. It is very relevant to family historians that he examines the reasons both for the expansion and for the decline of its specialised firms, which in their heyday exported goods around the world. The second section, on local archives and records, provides a useful listing of the hotchpotch of resources that arises from the complicated history of local government, but it surely would have benefited from more than one small-scale map, and a better account of local newspapers. At first sight this section is very lacking in illustrative detail, but this is to some extent compensated by the social history, the detailed job descriptions and indeed the references to local records in the first eight chapters. In short, this book provides only a very brief introduction to tracing our Black Country ancestors, but it is recommended as a very readable and apparently authoritative guide to their social history. David L Walker, Friends of The National Archives. The Black Country is a relatively small area, but its unique heritage culture and dialect warrant further attention from historians. The region is geographical rather than administrative, which can prove nightmarish for the family historian with BC ancestors. We have to move around between four archives, three counties and four metropolitan boroughs, encompassing Wednesbury, Darlaston, Wednesfield, Olbury, Caseley, Tipton, Dudley Brierley Hill, Halesowen. Confused? Thankfully, this new book benefits from a clear layout, with its chapter on archives and resources, and a detailed appendix on local government providing a comprehensive overview for researchers. This area is, very roughly, that part of England bounded by Wolverhampton, Walsall, Birmingham and Dudley with an industrial diversity that included coalmining, glassmaking, nail and chain making and car production. This introduction to the history, heritage and genealogy record of the Black Country in the West Midlands gives a colourful insight into the area’s unique past and the lives of its inhabitants. Much like its Northern counterpart, Lancashire, the Black Country was transformed into one of the most important industrial areas in the world, thanks to its rich coal resources. The latest in Pen and Sword’s Tracing Your… series, this book fills a gap in family history bibliography. The Black Country is a relatively small area, but its unique heritage, culture and dialect warrant further attention from historians. Thankfully, this book benefits from a clear layout, with its chapter on archives and resources, and a detailed appendix on local government providing a comprehensive overview for researchers. The Black Country in the West Midlands is an important site for family historians. Many researchers, seeking to trace their ancestry back through the generations, will find their trail leads through it. And yet, despite the burgeoning interest in genealogy and the importance of the region in so many life stories, no previous book has provided a guide to the Black County’s history and to the documents and records that family historians can use in their research. In this accessible and informative introduction to the subject, Michael Pearson looks at the history and heritage of the region and gives a graphic insight into the world in which our ancestors lived. He concentrates on the role the Black Country played during the industrial revolution when the development of mining, industry and transport transformed the economic and social life of the area. This was a period when living and working conditions were poor, families were large, children worked from an early age, often in the mines, and life expectancy was less than 20. As well as retelling the fascinating story of the development of the Black Country, the author introduced the reader to a variety of records that are available for genealogical research, from legal and ecclesiastical archives, birth and death certificates to the records of local government, employers, institutions, clubs, societies and schools. Michael Pearson’s new book is sure to be a great help to those researching their Black Country ancestors. It’s an area of England that hasn’t received a great deal of genealogical attention to date – an anomaly, considering its importance during the Industrial Revolution. It is also an area in which many of us will uncover forebears during our research, precisely because it was here that many flocked to work in the mining, steel and iron industries that burgeoned during the 18th and 19th centuries. In addition to providing invaluable assistance to family historians, Tracing Your Black Country Ancestors is an interesting insight into a geographically undefined but immensely characterful and proud area of England. It wisely begins with a clear definition of where exactly the ‘Black Country’ is, while allowing for the fact that it has no official status. An included map from 1830 summarises it best, focused on Dudley, Sandwell, Walsall and Wolverhampton, and it seems the name itself probably dates from a similar era. Retired police inspector Michael Pearson is also editor of The Blackcountryman journal, and proves an expert guide to the diverse history of the region. 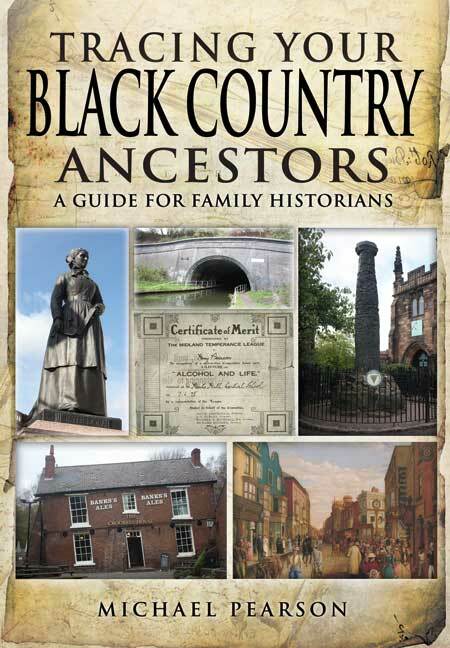 Read it for an excellent researcher’s guide to ancestors in the Black Country. Within this excellent ‘local history’ are scattered references to relevant sources of information – many of them to items on the Internet – that may be of interest to Family Historians. They would be of great interest for anyone who had an ancestors hailing from this part of the UK.